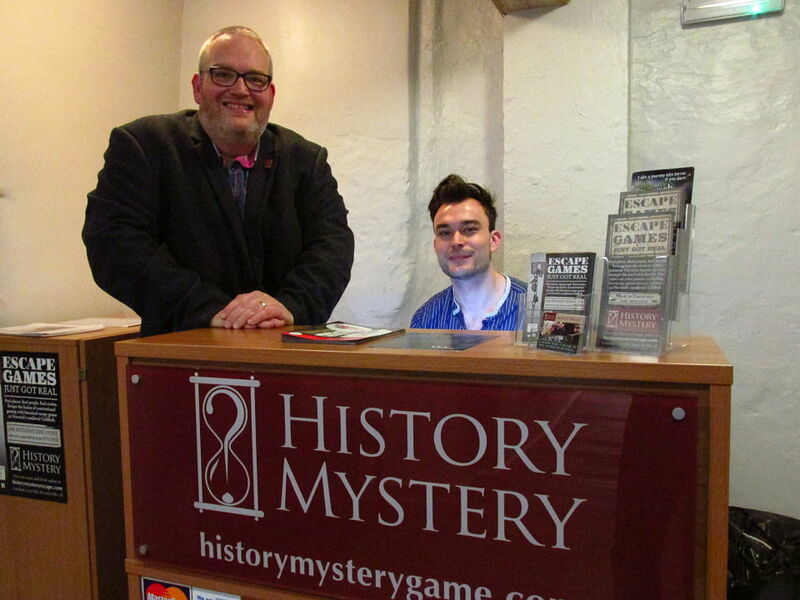 Business owner Alasdair Willett is thrilled at the popularity of History Mystery’s first game site on Norwich’s medieval Guildhall Hill since opening their first game room in February 2016. A second game room opened in June 2016. Captivate Heritage Ltd, trading as History Mystery brings the world-wide escape game phenomenon to the fine city of Norwich with true stories and game-play that is a real hit with first-time players and expert escape gamers alike. Providing history-based live escape games, History Mystery is an exciting new way to enjoy a uniquely fun experience with family or friends. It offers an exhilarating hour of interactive puzzles and discovery for two to seven players, based on the real stories of people and places, played in the historic locations where those stories actually happened. Members of the public can race against the clock to solve a gruesome Victorian murder, or romp through hundreds of years of the city’s rich history, finding clues and solving puzzles as you go. Our thrilling live escape games take place in rooms steeped in history and rarely seen by the public. What makes History Mystery unique? The ‘escape game’ concept is one that is proving hugely popular in cities around the globe. Escape games are a visitor attraction phenomenon that is sweeping across the world, winning huge appreciation scores on TripAdvisor. The concept started in Japan, grew in continental Europe, and is now rapidly taking hold in the UK and North America. We add unique heritage elements to this proven format, creating an exciting, interactive and immensely fun experience that is directly relevant to the historic locations were set up in. I had enjoyed playing a couple of escape games and looked into franchises, but wanted something different the norm. Once I came up with the unique idea of devising games based on real history and setting them in historic sites, I knew I had a business. How did Nwes help you? Through Nwes, I attended a business training course, gained support in developing my business plan, and secured a Start Up Loan to give History Mystery the boost it needed to get off the ground. I will receive continued support under the Start & Grow programme, which is also delivered by Nwes, to expand and grow the business. Having proved the viability of the business and the quality of the product in Norwich, I am thinking about future investments to allow me to repeat the model at new locations, producing new and unique games at each. I’d encourage people to get as much business advice as you can. Learn everything you can about marketing; market your business every day and never stop. Don’t underestimate how hard it is to get people to part with their hard-earned money! The best thing about my business is that customers get to have so much fun and in nine months I haven’t had an unhappy customer. It’s great to know that you are delivering an experience that people really enjoy!